We are constantly looking for partners to contract to. We offer discounts to other contractors for using our services. Let us know if your company has a need for our services. We excel where others have failed! Give us a try! Most machines are mechanically sound. Let JIT integrate an inverter or a PLC. We can also replace old CRT technology with new, energy efficient LCD technology. Xycom, Biesse, and many other manufacturers! Have laptop...will travel. We have the software for many Industry standard controls, including Allen-Bradley, Automation Direct, Matsushita, Nais, Panasonic, Omron, Siemens, Mitsubishi, and more! JIT offers calibration services for most controls. 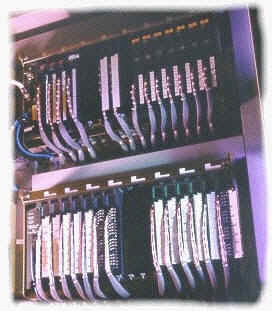 JIT offers networking and repair specialists to fit most any need. JIT offers Licensed Electrical Services. Here are a few links to the many manufacturers we support. This list is constantly growing. If you have any reciprocal links that you want to add, let me know. JIT is an area leader in Industrial Electronics. JIT specializes in Industrial Electronic Repairs and Upgrades, Retrofits, CNC Services, PLC Programming, Automation, Calibration, Computer Networking, PC Repair, and Electrical Services. When you call JIT, you can be assured that you are getting fantastic service, experienced technical assistance, and a reasonable rate. JIT field service technicians are factory trained and qualified to work on today's modern machinery and yesterdays relics. The technicians that are dispatched to your location have been working in the area (and around the world) for the last decade. You will probably see a face or hear a voice you are familiar with. Give JIT a call today...and get your machinery running quickly and affordably. Here's how to get us! JIT has opened an eBay store! Click here to view the store or click below for more info. -Select a Country / Region- Andorra Antigua and Barbuda Argentina Aruba Australia Austria Bahamas Bahrain Belgium Bermuda Brazil Bulgaria Cambodia Canada Cayman Islands Chile China Colombia Costa Rica Croatia Cyprus Czech Republic Denmark Dominican Republic Egypt El Salvador Estonia Finland France French Polynesia Gabon Germany Ghana Greece Grenada Guatemala Honduras Hong Kong Hungary Iceland India Indonesia Iran Ireland Israel Italy Jamaica Japan Jordan Kenya Kuwait Latvia Lebanon Liechtenstein Lithuania Luxembourg Macao Malaysia Malta Mexico Monaco Nepal Netherlands Netherlands Antilles New Zealand Nicaragua Nigeria Northern Mariana Islands Norway Oman Panama Peru Philippines Poland Portugal Qatar Reunion Romania Russian Federation Saint Vincent and The Grenadines Saudi Arabia Singapore Slovakia Slovenia South Africa South Korea Spain Sweden Switzerland Taiwan Tanzania Thailand Trinidad And Tobago Turkey Turks And Caicos Islands United Arab Emirates United Kingdom United States Uzbekistan Venezuela Viet Nam Virgin Islands, British Virgin Islands, U.S.